Every season for the past decade we at TSO make the trek to southeastern Ohio to hunt public lands with our good friend Ottie Synder in pursuit of buckeye state bruisers. Southeast Ohio is a great alternative for beleaguered and frustrated Pennsylvania hunters looking jumpstart their hunting season. Ohio has many similarities to Pennsylvania in that it has massive amounts of public land, an avid resident hunting population, and a variety of terrain to choose from ranging from big woods to urban hunting but it is Ohio’s differences that draw the TSO team out of Pennsylvania during the peak of the rut to chase trophy Buckeye Bruisers. Doug Surra poses with a Buckeye State Bruiser harvested during the Ohio Archery season with a crossbow. Ohio does not have a rifle season. I am not advocating for Pennsylvania to do away with its rifle season but Ohio’s lack of a rifle season has its advantages. As you can see on page 5 of the Ohio Hunting and Trapping Regulations 2012 – 2013 Ohio has a long archery season with full crossbow inclusion and two very brief early and late season muzzleloader and shotgun seasons. Ohio hunters have less opportunity to harvest deer with a gun which reduces the amount of deer taken outside of bow range. This leads to an older more mature buck population, which in turn leads to bigger bucks and draws the likes of hunters like myself searching for trophy whitetail. Ohio does not allow for spotlighting after dark. This not only significantly diminishes the amount of deer killed by poachers by removing the tool many of them use to hide under the cover of darkness, it also has the added bonus of forcing hunters to get out of their vehicles and into the woods during daylight hours to scout for their hunting location, making finding a bruiser more difficult, and reducing hunting pressure generated by lazy, fair weather hunters. Spotting is a long-standing tradition in Pennsylvania and any effort to outlaw this activity would face strong opposition. I have to admit I have more than my fair share of memories cruising through rural Elk Co. spotting deer in my father’s beat up Dodge Ram Charger, which he used to plow snow, with my uncle Steve and two brothers and I cherish those. However, the fact remains that Ohio’s law making spotting illegal coupled with a lack of rifle season equates to less wounded and illegally harvested deer and older more mature bucks. Tom Buterbaugh of Catching Chrome Angling Services (CCAS) downed this Ohio public land monster less than 6 miles from where the Surra buck was taken. Congratulaions Tom! Ohio also allows Sunday Hunting while Pennsylvania remains bitterly divided on the issue. Ohio accomplished this feat by striking a compromise with private landowner’s and giving them more authority over their own land and adding stricter penalties for trespassing. Written permission is required for hunting and trapping on private land in the Buckeye State whether the land is posted or not. The maximum penalty for hunting without written permission of the land owner for a first offense is 60 days in jail and a $500 fine. Jail time increases to 90 days with a fine of $750 for second time offenders. PA landowners (AKA: The PA Farm Bureau) needs to stop saying NO to sunday hunting and support Ohio-like laws requiring written permission for hunting private land and increased penalties for trespassing. Ohio residents do not despise the Ohio DNR and its deer management practices. Maybe that is due to Ohio having one government agency handling its natural resources while Pennsylvania has three OR maybe it is a result of a serious communication problem between Pennsylvania hunters and the Pennsylvania Game Commission. I think it is a bit of both but mainly the latter. Pennsylvania hunters do not trust the PGC and the PGC seems determined to ignore their outcries and discredit any input from its customers. The PGC’s unwillingness to both listen and act on behalf of hunters and their concerns is driving more hunters like myself out-of-state every year. Purchase topographical maps of the county you wish to hunt. You can usually get what you are looking for at the Eastern Sports & Outdoors Show for a reasonable price ($40). Use these maps to select the public land you wish to hunt. Spend the first few days of your trip scouting and hanging treestands. You will be amazed at what a little prep work will do for your success rate. Lastly, research room and board. A cheap hotel, campground, RV rental, or house/camp rental is only a click away. You dont need to live in luxury. A roof over your head and a warm place to stay dry will suffice. The Surra and Buterbaugh bucks were killed during the same week within 6 miles of each other. With some planning and organization a Ohio destination hunt can be both fruitful and affordable. 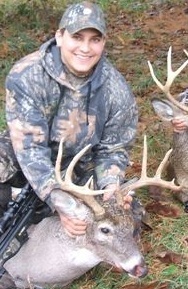 Plan a trip for 2013 and you could be holding your very own Buckeye State Bruiser next season. I didn’t really appreciate how good the hunting was in Ohio until I moved to Georgia – don’t get me wrong, I love hunting in Georgia, but every WMA has it’s own regulations, vs. Ohio and Pennsylvania, which had public hunting properties that used the same regulations and dates as the rest of the state, in addition to the various special hunts. We have never hunted in Georgia but i have hunted in South Carolina and Alabama with some Georgia boys! Ohio remains an excellent state for whitetail deer hunting and we hope you can make it back for a buckeye state hunt soon. It is definitely one of our favorite states for whitetail. I told my dad (he lives in Hartford, Ohio, NE Corner) that I’d try to schedule a week of bowhunting next fall. He usually hunts with some of his Amish friends all over the state. Man I hear ya about getting out of Pa and hunting Ohio. Hunting in pa is getting to be a big joke. The pgc really fouled up this state!